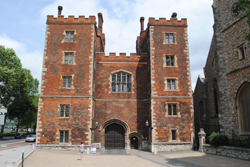 The London residence of the Archbishop of Canterbury, Lambeth Palace was first acquired by the archbishopric in around the year 1200 with Archbishop Stephen Langdon – an important figure in the whole Magna Carta saga – believed to be the first to have lived there. The complex built in the early 13th century included a chapel, a great hall, a ‘great chamber’ where the archbishop would receive guests, and private apartments for Archbishop Langdon, who was appointed to the archbishopric in 1207 and remained in the post until his death in 1228 (his appointment was a major point of contention between King John and Pope Innocent III and a key factor in the dispute which led to the creation of the Magna Carta). Not much remains of the original palace but the sections that do include the originally free-standing Langdon’s Chapel (although now much altered and connected to the rest of the complex) and the crypt beneath it (described as one of the best preserved medieval stone vaults in London it is now a chapel but was originally used for the storage of wine and beer). They are both believed to have been completed in about 1220 with the other buildings now present added later over the centuries. These include the formidable red brick gatehouse that fronts the complex today – known as Morton’s Tower, it is named after Archbishop Cardinal John Morton and dates from 1490 – while the Guard Room, which has its origins in the archbishop’s ‘great chamber’, dates from the 14th century and the infamous Lollard’s Tower – used as a prison in the 17th century – from the 15th century. The Great Hall – now used as a library, first established in 1610 – was rebuilt in the mid 17th century although it is believed to stand on the site of that first used by Langdon (we’ll deal more with the later history of Lambeth Palace in a later post). WHERE: Lambeth Palace, corner of Lambeth Palace Road and Lambeth Road (nearest tube stations are Westminster, Waterloo, Vauxhall, and Lambeth North); WHEN: Guided tours (90 minutes) only – check website for details; COST: £12 a person plus £2.95 booking fee (under 17s are free); WEBSITE: www.archbishopofcanterbury.org/pages/about-lambeth-palace.html.